Caring for your child. Caring about your needs. We try our best to give each child a strong foundation for success! 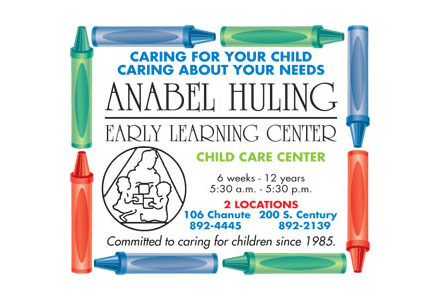 Established in 1985, Anabel Huling Early Learning Center (AHELC) provides excellent early childhood care, dedicated to the intellectual, physical and emotional development of every student. A not for profit 501C-3 corporation, AHELC provides a warm and loving environment and ensures that all children are given quality care and attention, ensuring that all families with in our community receive quality childcare. A staff of caring professionals who understand children's needs and respect their differences, allow child to grow to their full potential. Operating from two locations, AHELC serves 108 children, ages 6 weeks to 12 years!